These days, they seem to be on-trend, but they’re much more than that. Essential oils have gained popularity, not only for their lovely aromas, but also for their healing properties. Their benefits extend beyond aromatherapy and can do wonders for those looking to partake in massage therapy. With that said, we will highlight nine essential oils used at Farnatchi Spa, along with their origins and benefits. Neroli oil comes from the bitter orange tree (Citrus aurantium), a species that actually produces three unique essential oils. Neroli Oil gives off a mix of citrusy and floral aromas and has the ability to reduce inflammation, lower blood pressure and reduce stress. It also repairs and rejuvenates skin, and functions as an antioxidant and antimicrobial agent, hence why we use it here at Farnatchi Spa. It is a vital part of our special nectarome back massage, where it is used to release tension along the spine. Argan oil comes from the argan nut, a byproduct of the Argania spinosa tree, which is only found in Morocco. It is a jack-of-all-trades oil that can treat skin infections, bug bites, skin rashes, and so much more. It’s commonly used to rejuvenate the skin and to maintain healthy hair. Here at Farnatchi Spa, we use argan oil in our ILA treatments to nourish the skin and exfoliate the pores. Ginger oil, which comes from the ginger root, is often overlooked as an essential oil. Ginger itself is commonly included in tea which can soothe digestive troubles and nausea. However, the oil goes above and beyond by treating infections, respiratory troubles, anxiety, and muscle pains. Here at Farnatchi Spa, we use ginger oil in our tonic massage, a nectarome treatment that alleviates muscle tension. We add ginger oil to this massage treatment for the purpose of relaxing the muscles. Rose oil comes from the Damask rose flower (Rosa damascena) and has numerous benefits for one’s physical and mental health. Rose oil can improve symptoms of depression and regulate hormonal imbalances. It also acts as an antimicrobial agent and an acne treatment. At Farnatchi Spa, we use rose oil in our relaxing nectarome massage to ease stress and induce feelings of calmness, both in the mind and in the muscles. Sandalwood oil is another overlooked essential oil which comes from the sandalwood tree and produces a woodsy, sweet smell. It’s frequently used in incense, perfumes, and aftershave products. It brings healing power that promotes mental clarity, anti-viral, antiseptic, anti-inflammatory, and anti-aging effects. Sandalwood oil is also a powerful astringent, meaning it can soothe, tighten, and cleanse the skin. For that reason, we use it in our Ananda face therapy since it stimulates energy to skin cells, which heals skin tissue. It’s also an antioxidant powerhouse. That’s why we use juniper berry oil in our Prana Vitality massage to detoxify the body and restore its energy. As its name suggests, geranium oil comes from the Rose Geranium flower (Pelargonium graveolens) and produces a sweet smell. Geranium essential oil has a laundry list of benefits ranging from blood pressure reduction, improvement of dental health, and hormonal balancing. However, it is of particular use at our Farnatchi spa because of its skin toning, muscle-relaxing, and mood-lifting properties. For that reason, we use geranium oil in our Prana Vitality massage which is designed to boost energy and mood. Lemongrass oil and its citrusy qualities (not to mention its aroma) come from lemongrass itself, a popular herb used throughout Asia and Oceania. It is a truly versatile essential oil. It works as a deodorant, insect repellent, digestive aid, pain killer (especially for headaches), immune booster, an antibacterial agent and an antifungal agent. However, it is also a powerful treatment for stress/anxiety, muscle tension, clogged pores and more – three complaints we address in our Prana Vitality massage. With that said, we use lemongrass in the aforementioned massage treatment. Eucalyptus oil comes from the eucalyptus tree species which is native to Australia. You might be familiar with its intense aroma and the fact that it’s used to relieve aches and pains, sore throats and coughs, and allergy symptoms. It’s also used to boost mental clarity. Here at Farnatchi Spa, we use eucalyptus oil in our Hammam treatments because it treats skin irritation and can restore a glow to the skin. Essential oils have rapidly grown in popularity over the years, especially for their use in aromatherapy and for beauty purposes. However, the use of these oils reaches far deeper than the exterior of the body. As you can see from the breakdowns above, these oils have many healing properties that can benefit you from the inside out. Not only can they give your skin a new glow, but they can also relax your muscles, calm your mood, and so much more. 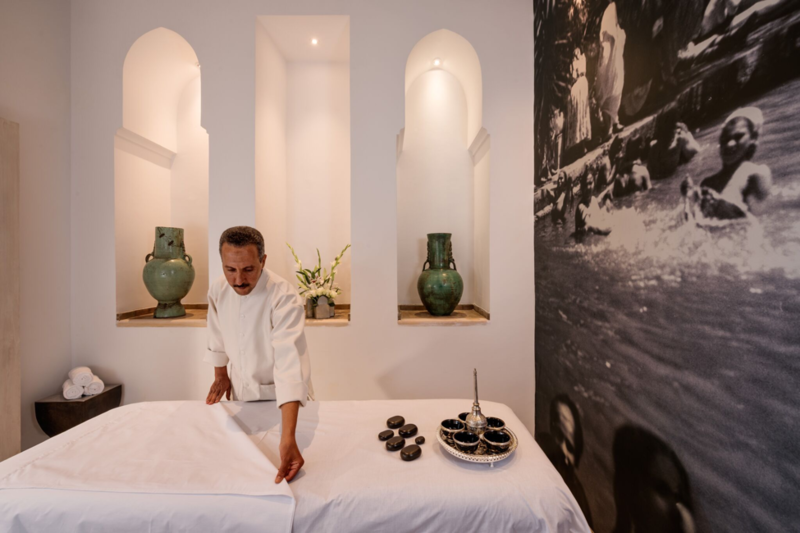 So if you’re planning to visit a Marrakech spa for a massage or spa treatment, remember ahead of time that you’re in for a stress-busting, body-energizing treat. Book your appointment at Farnatchi Spa today.